I know, it's not St. Patty's Day yet! But, today is National Irish Coffee Day and I want to celebrate! I found this great recipe that has dark chocolate spiked with Irish cream and whiskey to add festive flavor. And while they’re not necessarily a “health food,” the substitution of avocado for the traditional heavy cream makes these bite-sized goodies a little better for you. The creamy texture of the avocado mixes with the chocolate to create the same ganache-like texture as traditional truffles. And the best part is, you can’t even tell that a switch was made. Coat truffles with melted chocolate and sprinkles or even just cocoa powder if you prefer. 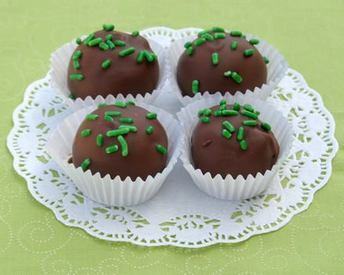 They are wonderful to serve with a little Irish cream for sharing at a party. These cute truffles won’t leave you with a hangover the next day.